12 December 2014 - An enchanting stage adaptation of Burton's beloved modern classic tale. Johnny Depp made a screen icon of Edward Scissorhands, a boy who is still unfinished when his inventor dies. Here, Dominic North and Liam Mower share the role. Alone and friendless, with sharp, unwieldy blades where his hands should be, Edward attempts to make his way in the world. Featuring the beautiful, unmistakable film music of Danny Effman, this touching and witty fairytale follows Edward from his unfinished, abandoned origin into the strange new world of suburbia. Left with only scissors for hands, Edward strives to find his place among a well-meaning community who struggle to see past his strange appearance to the innocence and gentleness within. Matthew Bourne and New Adventures' magical adaptation of Tim Burton's beloved film fable returns to Sadler's Wells after sell out performances in Europe, America and Australia. After global success with his inspired interpretations of Swan Lake, Sleeping Beauty, Cinderella and many more Bourne has once again teamed with New Adventures for this outstanding production. 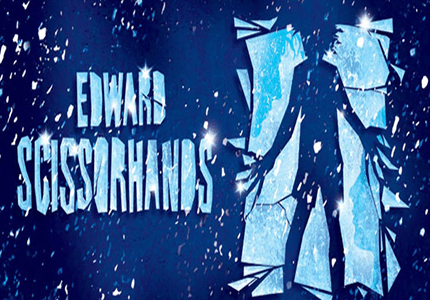 Edward Scissorhands features designs by Olivier Award winners Lez Brotherston (set and costumes) and Howard Harrison (lighting) with sound design by Paul Groothius and additional music by Terry Davies. Edward Scissorhands is suitable for older children who are accompanied by an adult. Click here for the Sadlers Wells seating chart and seat price guide.